In the mid-1960s Tartan tracks were developed, surfaced with a product by 3M. The name Tartan is a trademark, but it is sometimes used as a genericized trademark. This process was the first to commercialize a polyurethane surface for running tracks, though it was originally conceived for horse racing. Many Tartan tracks were installed worldwide, including at many of the top universities in the United States. Among that list was a Tartan track installed in the Estadio Olímpico Universitario, home of the 1968 Summer Olympics at Mexico City, which were the first global championships to use such a track. Olympic shot put champion Bill Nieder was instrumental in developing the product and selling it for this first use in the Olympics. An all-weather surface has become standard ever since. There are other techniques that distribute small chunks of rubber then adhere them in place with various polyurethane or latex substances. Since the early 1980s, the manufacturer of the surfaces selected for most championship meets has been the Italian company, Mondo, again the trademarked brand name becoming sused as a genericized trademark. 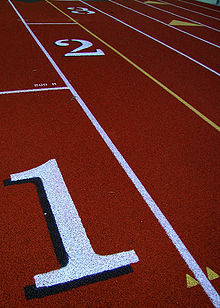 Mondo's track surface is called Mondotrack. The surface differs from the particles stuck in adhesion techniques, in that they are more of a rubber carpet, cut to size then tightly seamed together (in the linear direction along the lane lines). This form of construction gives a more consistent bounce (or energy return) and traction. Because of the tight fit specifications required for manufacture, construction surrounding these sites also has to be of a higher standard, making a Mondotrack one of the most expensive systems to use. Examples of Mondotracks were used for the 1996 Summer Olympics (since removed from the Centennial Olympic Stadium) in Atlanta, Georgia, United States; 2004 Summer Olympics in Athens, Greece; 2008 Summer Olympics in Beijing, China; 2012 Summer Olympics in London, United Kingdom and the 2016 Summer Olympics in Rio de Janeiro, Brazil.